Had a great tempo run on the track today during luch time. My warm up was from work to an out door track about a mile away. My plan was to run a steady 5 miles averaging 6:24 each mile. I was out in t-shirt and shorts enjoying the sunny day with 49 degree temperatures. After running 20 laps around the track I completed the 5 miles in 31:50 which I felt was a great time. 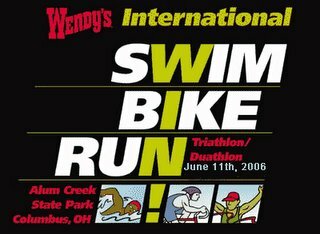 Today I signed up for the Wendy's International Triathlon! The race is held on June 11th in Alum Creek State Park and is my first triathlon race of the season. We will swim 1/2 miles, bike 16.8 miles, run 3.1 miles. I am getting all geeked up for the race season to start. Yep, that's me running on water! Don't know if I can keep up with you on those runs yet, but I'll try to run with you sometime soon. Cliff, Papa Louie really must be a faithful man. Nothing gets the geek on like registering for a race! And 5 miles in 31:50 is a fantastic time in my books!! Wow... reading blogs for inspiration and yours certainly is! First of all, how awesome to read your profile and how blessed & honored you are by your wife, kids and faith. Nice to see it 'put out there'...it is everything. Your training is great. Kudo's again..it's a lot to juggle and apparently you do it very well. Congrads! Oh yeah - race time! If you're willing to go down Columbus way to race, check out Fat Rabbit Racing's events. They put on a quality production and their proceeds usually benefit a local non-profit. And you can't go wrong with a race director that prays over the racers at the starting line.